Moniaive probably has more musical events and festivals (per head of population) than anywhere else in the country. 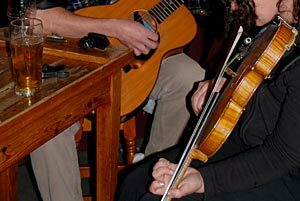 And with a sizeable group of traditional musicians living in the village and surrounding countryside our pub sessions are amongst the finest. Because of the spontaneous nature of sessions they are, with one exception, difficult to predict but having said that there’s usually a late night session in The Craigdarroch Arms following a gig. And if you happen into the Craigdarroch Arms or The George Hotel when a session is in progress you are in for a great night. The exception I mentioned is New Years Day in the Craigdarroch. From early afternoon musicians start arriving from around the village, from up the Glens, nearby villages and some from much further afield. The music continues non-stop until early evening when they all go for something to eat then most of the villagers head to The Institute for the Gala New Year Ceilidh. That’s a fun event for all the family. Visitors are often amazed to see all the kids up dancing. ‘It’s incredible that they know all these dances’ one remarked on entering the hall to find a Strip The Willow in progress with one set of adults and the other children. But it’s not really incredible. Children in Moniaive start learning Scottish dancing as soon as they start school. The premier weekend event of the year is the annual Folk Festival in May. This has been running since 2001 and attracts over 1000 visitors. The 8th Folk Festival ran from 9-11th May 2009 and had an all star line up headed by Irish band Dervish, Hilary James and Simon Mayor, Moishe’s Bagel and Absolutely Legless Irish Dancers. No fewer than four of our guests have also been booked for the prestigious Celtic Connections Festival. We had them booked before we discovered this so we must be doing something right. Moniaive Gala is held on the 3rd weekend of July every year. A free fun traditional family event. Parade of floats and fancy dress entrants followed by arena entertainent, sideshows, teas etc in Macara Park. Evening Gala Dance in Marquee in park. World Cream Cracker Eating contest, Car Treasure Hunt, Bingo, Five a side football, Pet Show and ‘Generation Game’ evening on Thursday and Friday preceeding Gala Day. Watch for Posters. 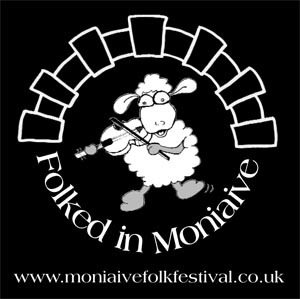 Moniaive Beer Festival is also held in September and as well as a wide selection of splendid beers features a weekend of live music. See the Bluegrass website for full details of their programme..